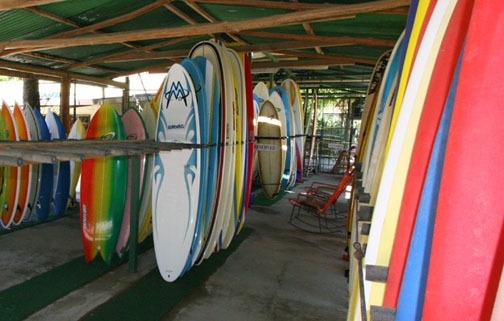 At Nosara Surf Shop, we have one of the largest surfboard rental and sales inventory in Costa Rica. We have over 160 boards for rent in all sizes and shapes, in both polyester and epoxy.You will find everything from a 5'8" WEBBER shortboard or XANADU fish to a 10' ROBERT AUGUST W.I.R. model or an 11' N.S.P. longboard. The large commercial airlines have raised their fees to carry surfboards and very often either lose or damage them. These days renting a board is more practical and less expensive. We also have SOFTTOPS and SOFTBOARDS for beginners. Our rental inventory has everything for beginners and intermediate surfers as well as the very selective and advanced shredders. Nosara Surf is one of the original surf schools in Nosara and has taught many people to ride-as well as helped intermediate and advanced surfers get to the next level. We always have an in shop EXPERIENCED, PROFESSIONAL INSTRUCTOR, ready to help you get started with your surfing adventure. We can also work with more experienced surfers to tune-up your style and eliminate bad habits. Most of our instructors are competition level surfers, so whatever your level of experience, they can definitely help you improve your style. All are Red Cross certified and at least Level 1 ISA. Walk-ups are welcome or you can book ahead to shape the perfect schedule for your trip. For the experienced surfer interested in surfing other beaches and different waves and maybe catching some fish for dinner, we can also organize a tour either by boat or van, with an experienced guide or captain. There are many surfing beaches with GREAT waves north and south of Nosara. The local area around Nosara is as natural as it gets, even for Costa Rica. We offer SUP tours into the mangroves as well as offshore to the local reef breaks. We also offer ATV tours to the local waterfalls and to the Turtle beaches around Ostional. Our guide is a Nosara native who grew up in the Turtle Preserve and has a deep love for the area. His tours have had rave reviews from all. 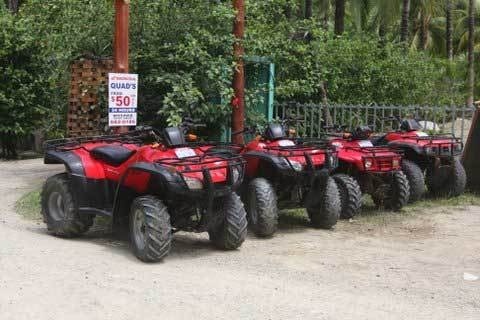 You'll find an ATV is the best way to get around Nosara, not only practical but fun! Head out on your own or take advantage of our guide, to show you all the best spots. We offer ATV rentals for a half day, full day or by the week. Discounts are given for weekly rentals. Reserve yours today. Being a true Tropical Paradise, there are also many natural waterfalls to visit. Most have large pools perfect for swimming. Pack a lunch a make a day if it! Surf Shop Shops supplying surf boards, wetsuits, clothing, leashes, wax, deck pads, fins, DVDs and anything you might need to go surfing. Surf Guide Surf Hire For surf hire, wetsuit hire, boots, hats, gloves, leashes and anything else you may need to go surfing. 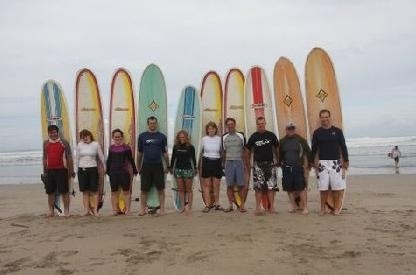 A range of surfboard hire is usually available, whether you want to rent an SUP, body board, mini-mal or short board. Surfboard Repairs From minor dings to major damage someone here should be able to help you get your favourite board back in the water. Surf School Schools with qualified surf instructors offering lessons and courses with equipment hire to individuals or groups, whether you are a total beginner, an intermediate surfer or an experienced surfer looking to improve your ability. Local Information Information about the local area, not always from a surfers perspective. Guided Surf Tours Experienced guides with local knowledge who offer surf trips and tours to the best breaks and secret spots by boat, 4x4 or bus. Boat Trips From luxury yachts to fishing boats, boat trips often include great food, private cabins or shared rooms and are a good, fast way to get to the best hard to reach spots. Womens These businesses specialise in working with women surfers or women wanting to learn to surf.